we recently moved from Charlotte, NC back to Orlando, FL. my mom and I drove the boys back on Friday while my dad drove Ryan's car. Ryan and Alex drove the moving truck on Saturday. after many hours of unpacking during the weekend we got our necessities into our 3 bedroom apartment. the rest of our belongings are chilling in my parents' garage. why the move? we missed family. I missed my parents so much and wanted my boys to grow up knowing their cousins. fortunately Ryan is able to keep the same job ... and well so do I.
as far as cheeseburgers go I haven't eaten one in days ... over a week? sadly I can't remember when the last one was. I have, however, logged in some Florida miles. the past 3 days I've run at least 3 miles and boy have they been HOT. at least running in Orlando is virtually flat as a pancake so that's a plus. no set races on the calendar ... although I have my eye on a bacon race in 10 days. it's a 5k so I think I can rock it although my fastest 5k time lately has been averaging 8 minute miles. I still have some work to do. I'll get back here as soon as I can with some cheeseburger recaps. I finally got internet so that's been a huge lifesaver so that Mason can chill with the iPad during quiet time. 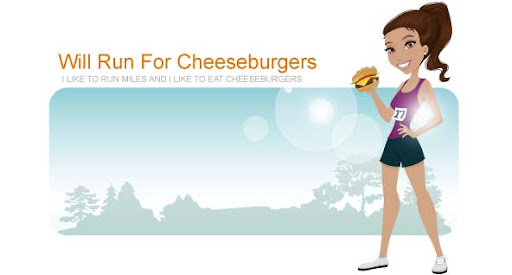 hope everyone is having a good week ... keep running and eating those burgers!